Silver-spotted Skippers are wide-ranging butterflies that are active from May through early fall. When their wings are folded or when they’re in flight, a large silvery patch on their otherwise mostly brown wings makes them easy to identify. The butterfly is named for this marking. Silver-spotted Skippers open the upper (dorsal) side of their wings to the sun when they are basking, revealing markings that resemble a stained-glass window. 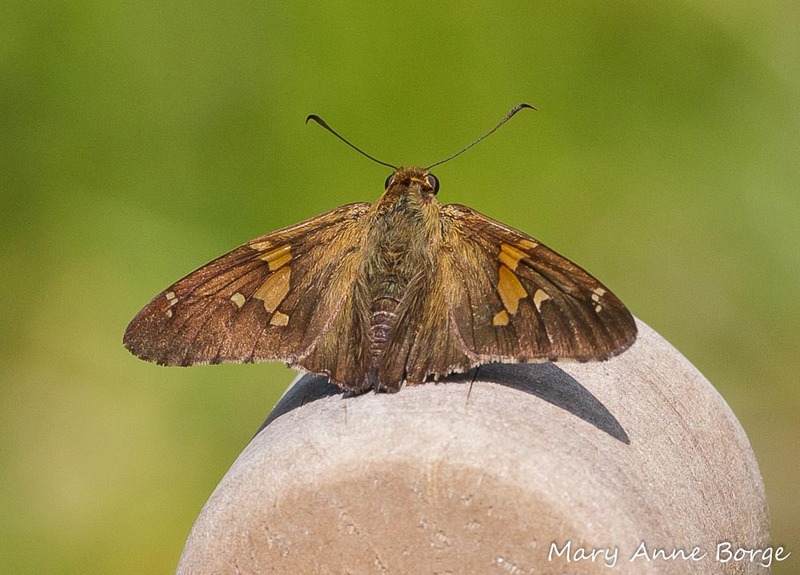 Silver-spotted Skipper, basking in the sun. I have to wonder if the silvery wing spot is an adaptation to make this butterfly resemble bird droppings. Insects, even butterflies, can be an important source of food for birds and some predatory insects. This disguise would likely give Silver-spotted Skippers some protection from these predators, since bird droppings don’t attract them. 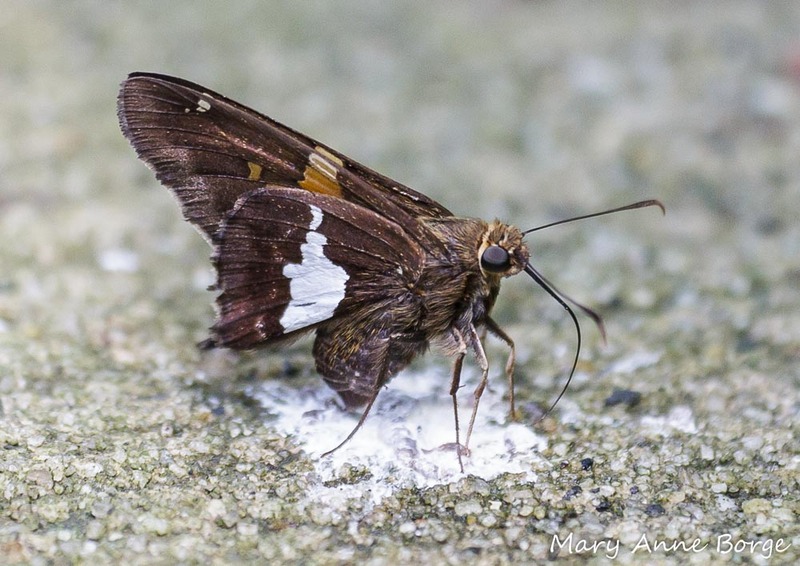 Silver-spotted Skipper, eating minerals from bird droppings. Does that silver splotch on the wings seem like a good disguise? 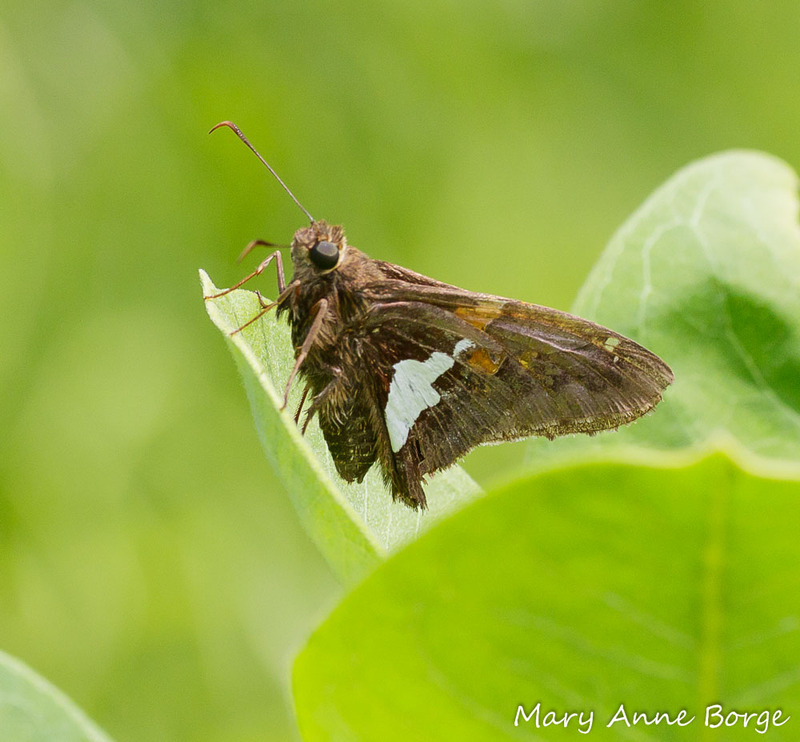 Silver-spotted Skippers can be seen drinking nectar from a variety of blossoms in meadows, along roadsides, marsh edges, and open woodlands, any place where they can also find the food their caterpillars require. So what’s the connection to peas? 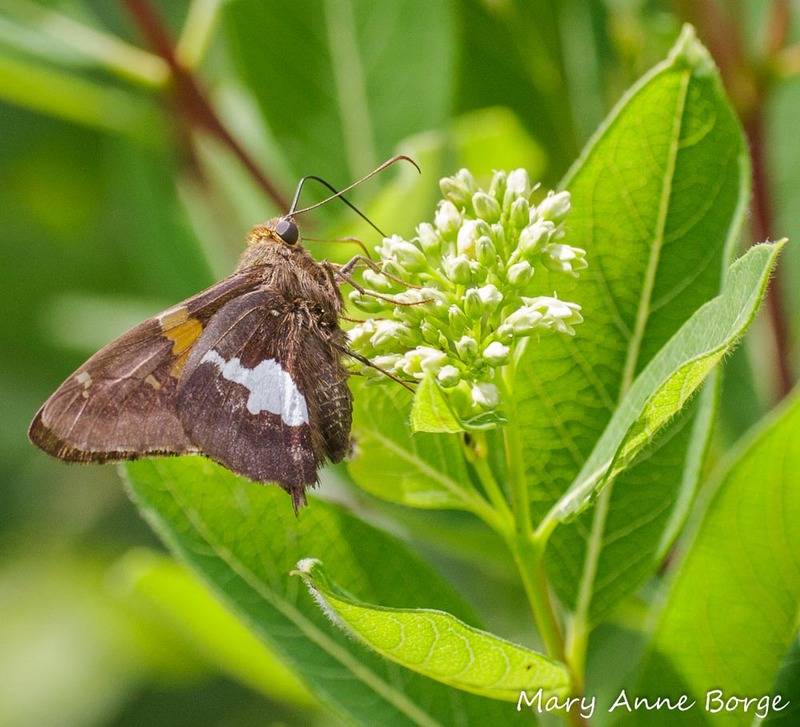 While Silver-spotted Skipper butterflies drink nectar from many different plants, it’s their caterpillars that ‘eat their peas’. 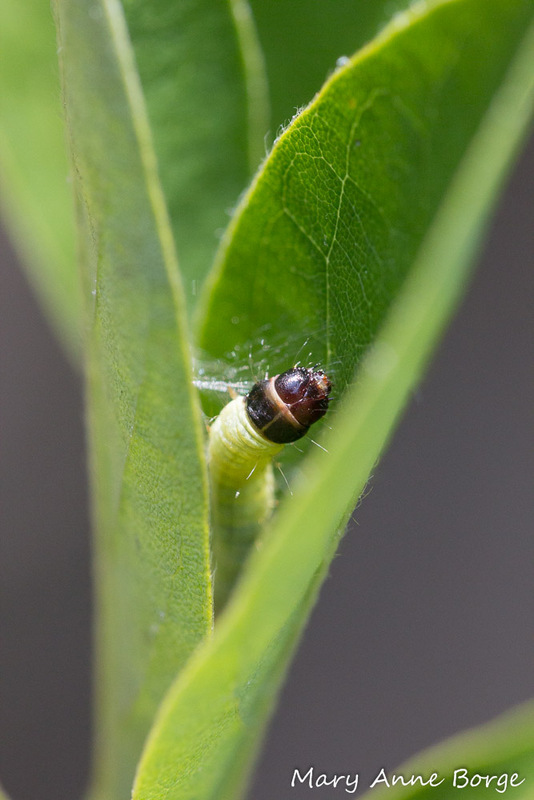 Silver-spotted Skipper caterpillars specialize on certain members of the Pea (Fabaceae) family, including Black Locust (Robinia pseudoacacia) trees, and several herbaceous (not woody) plants called Tick-trefoils (Desmodium species). The caterpillars typically munch on the foliage, flowers or buds of these plants, but they do it in such a discreet way that you would only notice if you were looking for it. 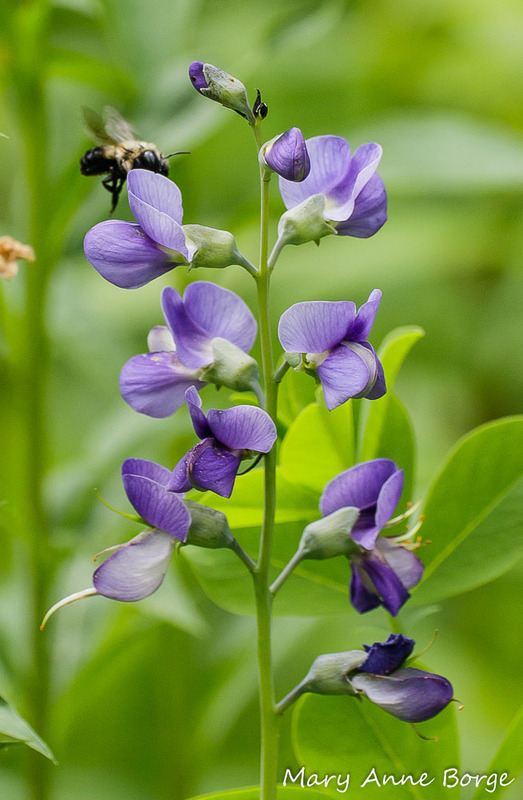 The Tick-trefoils all have three-parted leaves, and a tall-stemmed flower cluster. The pollinated flowers produce a chain of fruits that break apart when they’re ripe. Fruits disperse as hitchhikers on passing animals, including humans. I’ve often warn them home after a walk in the woods. This dispersal habit is the reason for the ‘tick’ part of the common name of these plants, since the fruits cling to an animal’s fur or clothing like a tick might. Some of the food plants on which the Silver-spotted Skipper caterpillars depend are especially garden-worthy. 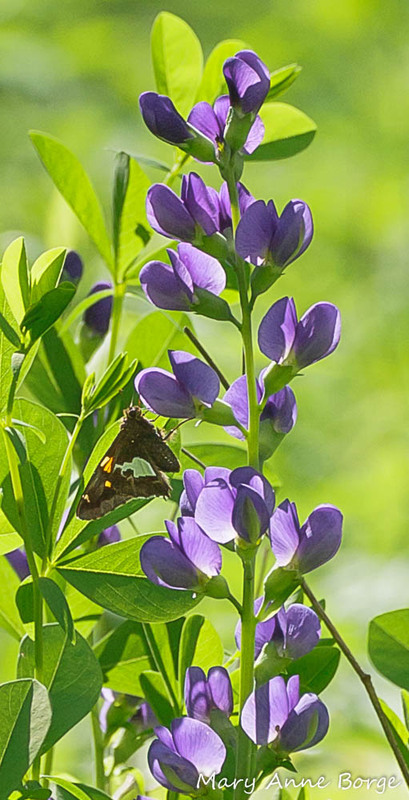 Blue False Indigo (Baptisia australis), also called Blue Wild Indigo, and other plants of this genus are potential food plants for Silver-spotted Skipper caterpillars. Its vivid purplish-blue flowers are primarily pollinated by Bumble Bees, but they are visited by other insects as well. 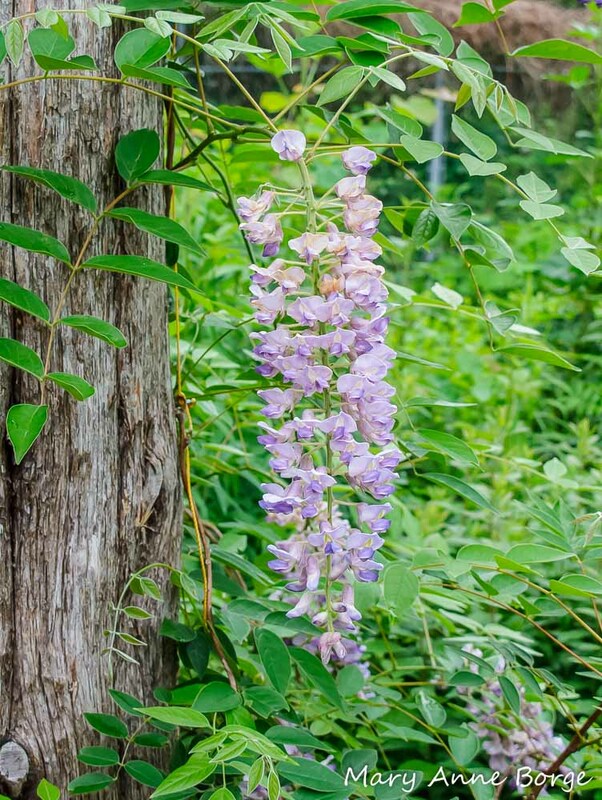 Blue False Indigo can grow to a maximum height of about 4 to 5 feet (1.25 to 1.5 meters), likes full sun to part shade, and can tolerate dry and clay soils. 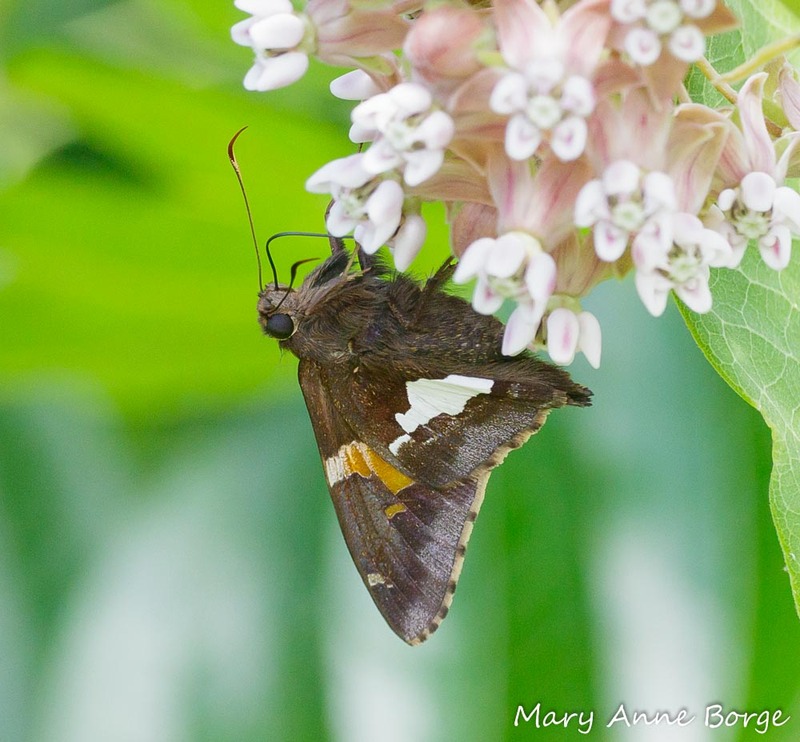 American Wisteria (Wisteria frutescens) is another favorite of Silver-spotted Skippers. It is a deciduous vine with long hanging clusters of violet flowers in early summer, great for use on an arbor or fence. 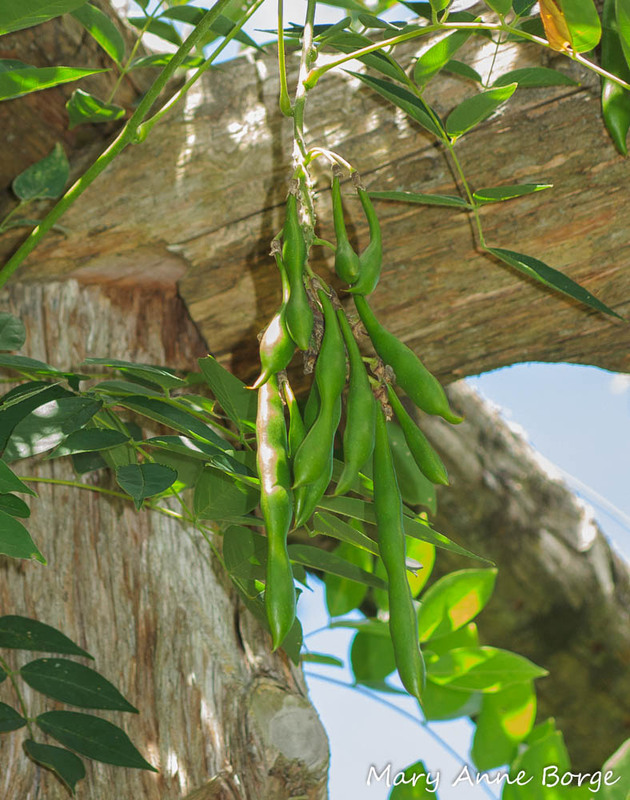 If its flowers are pollinated, they are replaced by long pea pods later in the season. Female Silver-spotted Skippers lay eggs on the leaves of their caterpillar food plants. The caterpillars hatch from the eggs, spinning silk to pull the leaves of their host plants together to create a shelter. Silver-spotted Skippers are not alone in their dependence on Pea family members. 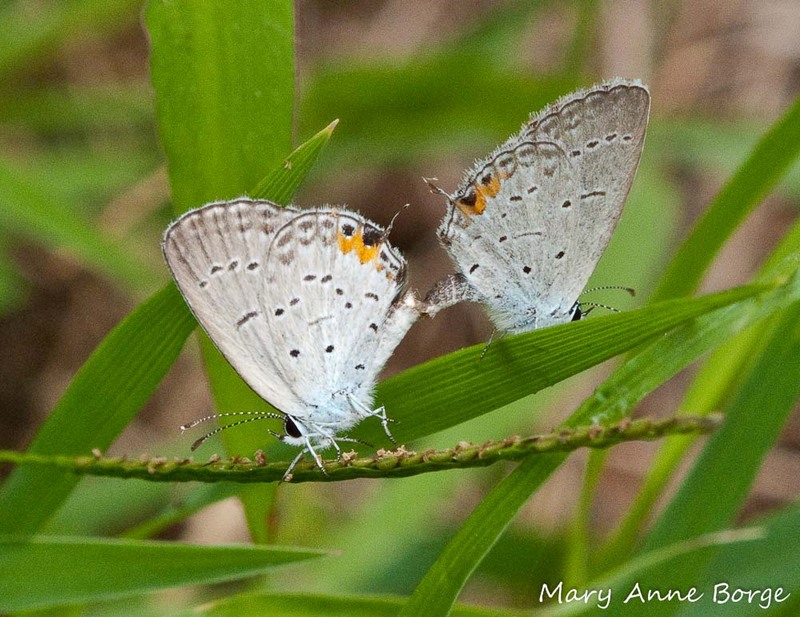 Gray Hairstreaks and Eastern-tailed Blues are among the other butterflies whose caterpillars ‘eat their peas’, using some of these same plants. 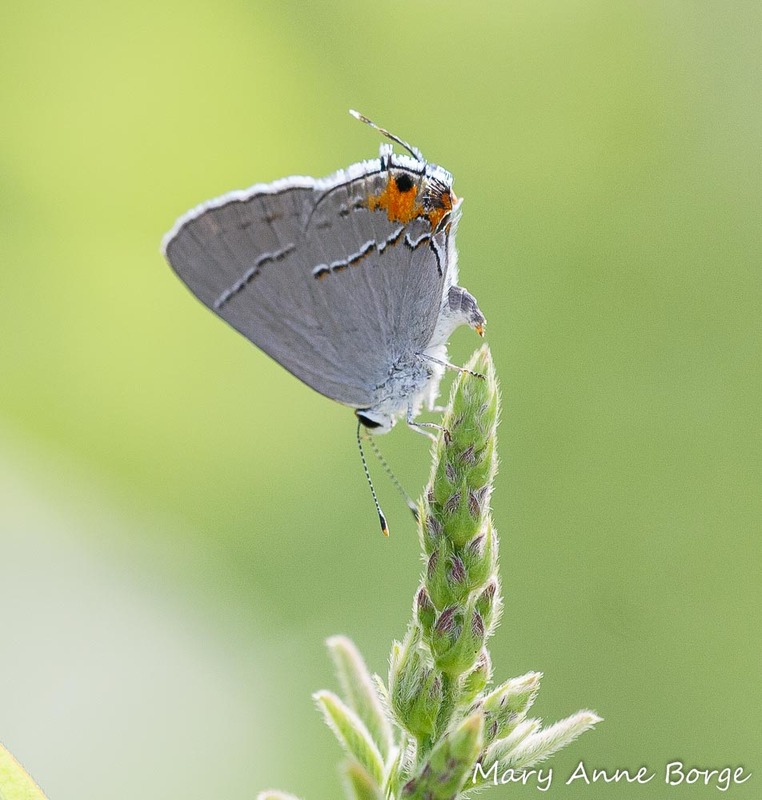 This entry was posted in Butterflies, Gardening for Wildlife, Native Plants, Nature and tagged American Wisteria, Baptisia australis, Blue False Indigo, Eastern-tailed Blue, Gray Hairstreak, nature, Silver-spotted Skipper, Wisteria frutescens by Mary Anne Borge. Bookmark the permalink. Fascinating. These butterflies are so common in my garden, so I read this post with great interest…and learned a lot! Bird droppings! OF COURSE! Amazing photography, as usual. Thank you! Thanks, Julie! Do you have any Pea family members in your garden that they might be using as caterpillar host/food plants? LOADS of baptisia and lespedeza. Need to remove chinese wisteria (super thug that it is) and replace with American wisteria. 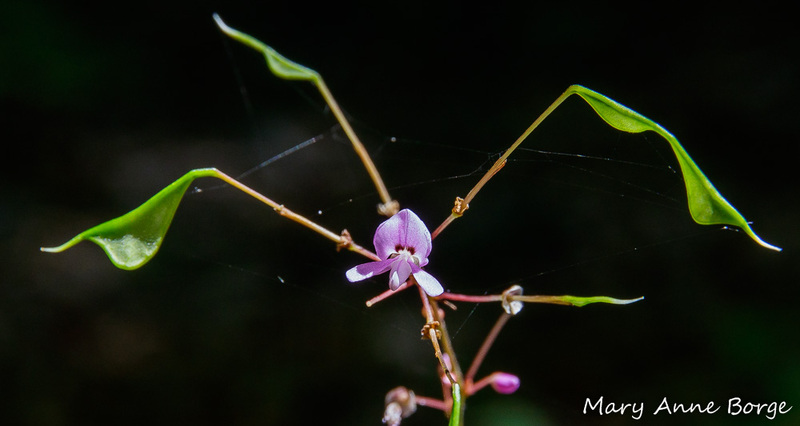 And…hmmm…I guess this means I need to stop weeding out the desmodium! Sounds great! You may get several butterfly species using them as host plants. Fascinating post! So happy to learn the silver spotted skippers enjoy wild indigo and American wisteria, as we have both in our yard. 😊 I’ll be looking out for them & their caterpillars! Another common, but non-Native plant that Silver-spotted Skippers use as a host plant is the invasive species, Kudzu Vine. This is particularly true in my area of far Northern Alabama and Southeastern Tennessee. Interesting! 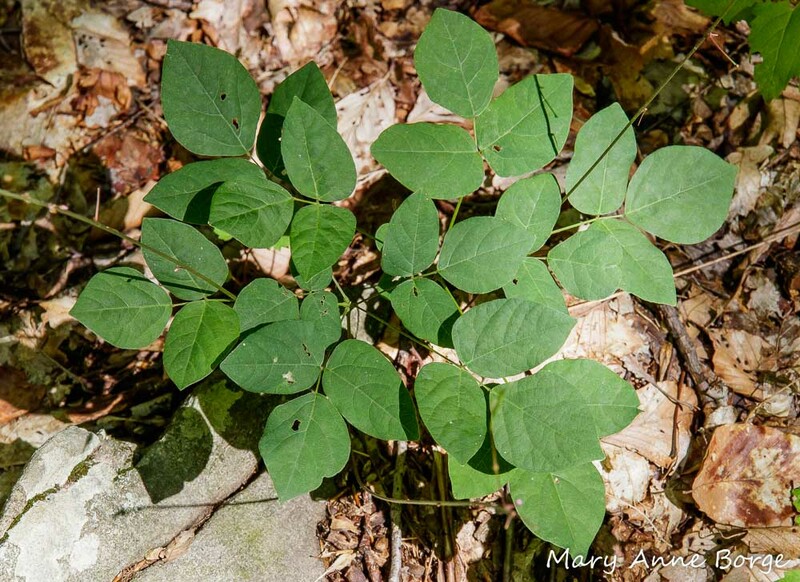 Kudzu is a Pea family member, so apparently its chemical composition is close enough to the native species for butterflies to lay their eggs on it. Do you know if the caterpillars have thrived, pupated, and completed metamorphosis? Thanks, Theodora! I hope you have a wonderful summer, too.